We Reward You For Signing Up Now! How so? Well here’s how. Regardless of if you are joining FirstDown PlayBook as an individual member or if you are purchasing a FirstDown PlayBook StaffPack, the sooner you sign up the more you will get for your money! Said another way, FirstDown PlayBook is rewarding you for signing up now instead of waiting until the fall to sign up for your membership. You get FirstDown PlayBook for longer. You get FirstDown PlayBook for less. What you get: a 2018 membership to FirstDown PlayBook AND when the editing tool is released you get it free for one year after we launch. In other words, pay now and put your wallet away until 2020. Monthly subscribers will not be eligible for this 2 year plan. The 2019 Editing Tool will cost $199.99 per year for those who wait. You will get FirstDown PlayBook longer and pay a lot less by signing up right now. Tap Here To Sign Up Right Now For Your Individual FirstDown PlayBook Membership. What you get: 15 annual memberships to FirstDown PlayBook right now AND when the editing tool is released you will be eligible to purchase a StaffPack with the editing tool feature at the same price in 2019. The 2019 FirstDown PlayBook StaffPack will cost $700.00 for those who wait. Your StaffPack members will get FirstDown PlayBook longer and pay a lot less by signing up now. Tap Here To Sign Your Group, League Or Organization Up For A FirstDown PlayBook StaffPack. As you can see the reward is huge for joining FirstDown Playbook now and not waiting for the editing tool to be launched. These offers will only be available for a limited time so be sure to act now before we pull the plug on it! 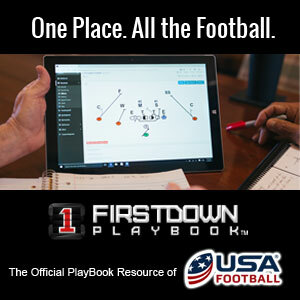 It is our way of saying “Thank You” up front for your loyalty and for the past three years that have seen FirstDown PlayBook grow into the premier football playbook resource in the world! Watch this short video to learn more about the FirstDown PlayBook StaffPack offer!